New York Rep. Sean Patrick Maloney, who is running for state attorney general, talks to WXXI's Karen DeWitt. New York Rep. Sean Patrick Maloney is running in the four-way Democratic primary for state attorney general after former Attorney General Eric Schneiderman resigned in May over accusations that he physically assaulted women he dated. It’s a short campaign season before the Sept. 13 primary. 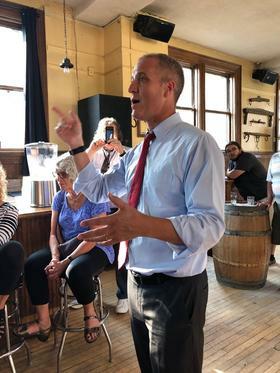 Now that Congress is in recess, the 52-year-old Maloney, who represents portions of the Hudson Valley, has stepped up his campaign schedule, with daily events across the state. The events include informal town hall meetings, like one this week at an Albany bar, where he promised to hold “30 town hall meetings in 30 days,” and early morning jogging sessions where he takes questions from the public. Maloney was a senior adviser in the West Wing under President Bill Clinton, and he served in the administrations of former New York Govs. Eliot Spitzer and David Paterson. If elected, Maloney would be the first openly gay statewide elected official. Speaking to reporters outside the Albany meeting, Maloney said fighting rampant corruption within state government would be a top priority. In 2018, several former associates of Gov. Andrew Cuomo were convicted of bribery and bid-rigging and two former legislative leaders were convicted in retrials on corruption charges. Maloney said he does not hold Cuomo personally responsible for the corruption, saying, “There’s more than enough blame to go around.” But he said the governor made a “terrible mistake” when Cuomo shut down a Moreland Act Commission on corruption before it finished its work. One of his opponents in the primary, Fordham law professor Zephyr Teachout, wants to reopen the Moreland Commission, arguing that since it was never formally shut down, it could be restarted. Maloney disagrees. Maloney said under the laws governing the Moreland Act, the commission is always under the power of a governor, and he said it was not possible for Cuomo to investigate his own administration. Maloney said if he’s elected as attorney general, he would seek “primary jurisdiction” to pursue all state corruption cases independently. “I don’t think the attorney general ought to participate in some dog-and-pony show cooked up by any governor,” he said. Maloney said if the governor and Legislature won’t cooperate, he’d coordinate more closely with federal prosecutors, including special counsel Robert Mueller, and with the state’s district attorneys, as well as New York’s comptroller. The congressman supports interim Attorney General Barbara Underwood’s efforts to pursue numerous lawsuits against policies of President Donald Trump and his administration. He said if he wins election to the post, he’d also pursue legal angles to try to force Trump to release his tax returns. Maloney criticized primary opponent Tish James for her recent comments saying she would not want to be known as the “Sheriff of Wall Street” if elected. The title was earned by Spitzer when he was AG for aggressively going after financial crime. That practice was continued by Cuomo when he was attorney general. Maloney said the state’s Martin Act was created in the 1920s to give the New York attorney general the power to go after wrongdoing on Wall Street. He said James’ statement was “the dumbest thing” he’d ever heard. Maloney also wants to enact public campaign financing to limit the influence of big-money donors in political campaigns, and he backs a complete overhaul of the state’s troubled Joint Commission on Public Ethics. And he said he’d like to see term limits for statewide officials and a ban on outside income for state legislators. Maloney is running second behind James in a Siena College poll of Democratic voters. But over 40 percent of the electorate is undecided. At the Albany bar, he told the 50 or so people gathered that he hopes they will make up their minds in his favor. The fourth candidate in the Democratic primary is Verizon executive Leecia Eve. If Maloney does not win the primary, he will still be on the ballot for his bid to be re-elected to his congressional seat in November.